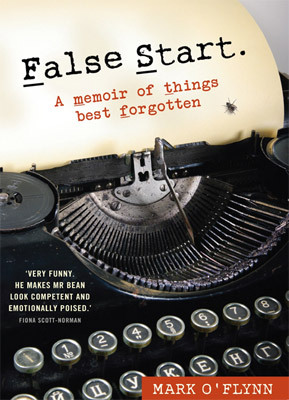 In False Start: A memoir of things best forgotten, writer and poet Mark O'Flynn reflects on the early failures which coloured his youthful attempts to find himself a career. As a recently graduated arts student in the early 1980s, he is told in no uncertain terms by his father to stop fruit picking and get a proper job! In an effort to get his son out of bed before midday and kickstart his career in the workplace, he arranges for Mark to work in a quarry in outback Australia. Dropped in the middle of central Queensland, and somewhat underwhelmed by the 40-degree heat, barrage of flies, never-ending parade of snakes and a steady diet of meat and beer, Mark encounters a group of men the likes of whom he has never seen before in his city life. Men the colour of boiled mutton, who work only as hard as they need to, play as hard as they can, adhere strictly to the rules of the union and call each other -Brother'. Soon Mark realises that the men are under the false impression that he is a -science expert' and decides the best and only thing to do is go with the flow. So begin Mark's adventures in being an -accidental expert', a situation he finds himself in on a recurring basis, whether it is as a rock specialist, a writer and actor thrust prematurely upon the stage or a special agent charged with the safe transport of a life-size statue of the Virgin Mary to Ireland. These laugh-out-loud accounts of three jobs that went -horribly wrong' continue the rich tradition of the great Australian yarn – and will appeal to readers who appreciate the unexpected and the bizarre wrapped in a laconic sense of humour. Mark O'Flynn's debut novel, Grassdogs, was published by Fourth Estate/HarperCollins in 2006, and a second novel, The Forgotten World, is forthcoming in 2013. He has published four collections of poetry. His poetry and short stories have appeared in a wide range of journals and magazines. In 2012, he placed second in the prestigious Newcastle Poetry Prize for -Hill End Sonnets'. Mark lives in the Blue Mountains in NSW. Question: Why did you decide to write False Start? Mark O'Flynn: I initially wrote the first section as a means of exorcising some slightly painful memories. I did not want to shy away from them, and the more I thought about that time the more I remembered, and the more I began to think them fairly entertaining. People I told those stories too thought they were interesting, so I decided to see if I could make use of my own history as a source of material. Without sounding high-falutin I read that Beckett was inspired by impotence. I thought that a strange thing to be inspired by, so I began to think about embarrassment, awkwardness, perhaps even humiliation as points of departure for a story. Question: Why was it important, to you, that False Start was funny? Mark O'Flynn: My last book, "Grassdogs" was a fairly bleak story. Some people thought it a sad book. So I definitely wanted to show a little variety, if not some versatility in my writing. Having said that, the tone, if it is funny, happened fairly naturally. In a mood of self-deprecation I did not want to take myself, or anybody else, too seriously. After all, what is interesting about my life? Not much really. So it had to be the tone to make it so. Question: What did you find difficult when writing this memoir? Mark O'Flynn: In part three there was a lot to be left out that was not relevant. At least twice before I have tried to use that material in a fictious way, as a novel, and as a film script. Both attempts failed. One publisher said that the character of my father-in-law was beyond belief. There was a lot of energy wasted there. So I decided to tell it straight, as it happened to me, rather than try to fictiuonalise it. Even so, there was a lot of other great stories that had to be omitted. Question: What advice do you have for young poets? Mark O'Flynn: Read. Read some more. Read other poets. Don't stop reading. It's old advice, but true. Be open to influence. As Mark Twain said - he who does not read has no advantage over he who can't. Question: Tell us about The Forgotten World. Mark O'Flynn: It's a novel set in the now vanished village in the Jamison valley in the 1870's-1890's. It deals with the people who used to live there in what is now effectively wilderness; how they survived. This time also coincides with the hey-day of the famous and very swish Carrington Hotel. These two enterprises were really the main reasons for Katoomba's existence. So it's a fictionalised history, with some of the real personalities of the day. There's a murder mystery, a jewel heist, but the main focus is on two half-brothers and their eccentric family who are trying to make ends meet in the difficult, dangerous and magical landscape of the Blue Mountains.